That year the European Music Awards were held in Lisbon, Portugal. Along with other stars, Green Day were there and nominated for many awards along with performing Holiday live. Billie Joe was wearing an all-black suit, as was Tré. Mike had a stripy black suit and a red tie. The guys did an amazing performance of Holiday. Billie Joe got the crowd going from start to finish and it was an overall huge success. 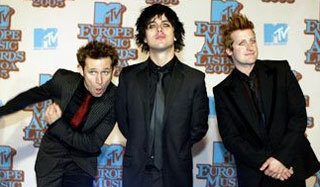 When it came to the categories in which Green Day were nominated, which included Best Rock Act, Best Album (for American Idiot) and Best Group, Green Day got 2 out of the 3 awards. The guys won Best Album for American Idiot and Best Rock Act. Gorrilaz beat the band to Best Group but it was no disappointment as they had already made their statement by picking up 2 awards along with Coldplay. When they picked up their first award they were amazed but after the second things could not get any better for our boys. Billie Joe had the crowd singing 'ole, ole, ole, ole' after the warm reception people had given them and they walked off the stage with smiles as wide as that of a cheshire cat. The group were ecstatic. I think that all of the fans can say how proud they are of Green Day and how much we appreciate and love what they are doing. Lets hope that this is going to continue for many years to come and that many awards are going to follow. We hope to see you at the European Music awards next year. And don't forget to vote, vote, vote for Green Day in everything to keep them at the top!